For the first time in history, Saudi Arabia will open some of its sports stadiums to women, the latest move by one of the world’s most restrictive countries to incrementally loosen its grip on its female citizens. Three stadiums—in Riyadh, Dammam and Jeddah—will be renovated and “ready to receive families starting in 2018,” Turki Al-Asheikh, chairman of the General Sports Authority, told Arab News. The rehabilitation will include the addition of restaurants, cafes and video screens in the venues, though it’s unclear whether seating will be gender segregated. 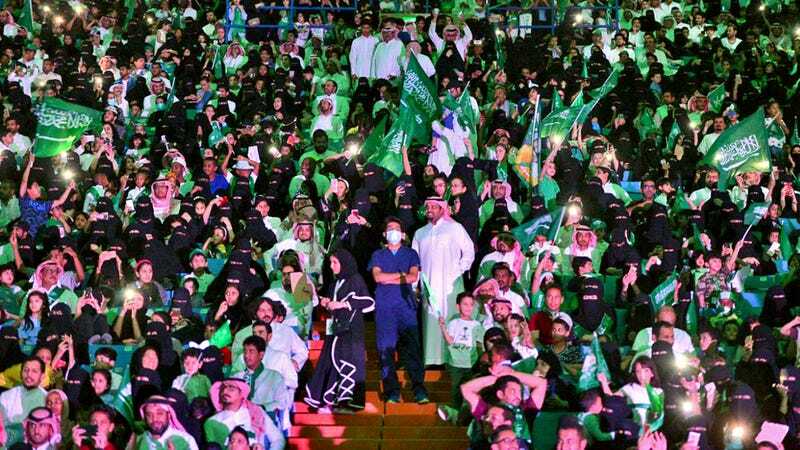 Hundreds of women were allowed to enter a sports stadium in Riyadh last month for the purpose of celebrating the country’s national day, but the event was merely a one-off. The implication from Sunday’s announcement, however, is that women will be able to regularly attend sporting events alongside men, though they’ll still be required to get permission from a male family member as part of its guardianship system. The move is part of a sweeping set of initiatives known as “Vision 2030,” in which the kingdom is looking to modernize as it prepares for a post-oil era. Included in the reform package was last month’s decree that women be allowed to drive, in addition to plans to lift a public ban on cinemas and encouraging mixed-gender celebrations, The Guardian reports. The changes aren’t in the name of gender equality so much as an attempt to get more women in the workforce, which the kingdom hopes to increase from 22 percent to 30 percent. But the increasingly relaxed laws have plenty of conservative detractors, and analysts have warned that backlash is likely. “First women driving, now stadiums. What’s next? Night clubs?” wrote one Saudi Twitter user. Imagine!